This update is part of the Province Profile series. You can also read the other Province Profiles. that believers from Light of Trang Church, and other Thai churches, would have a clear vision to reach out in love to their Muslim neighbors. for church leaders to be faithful examples of sowing the gospel broadly in Muslim communities. for MBBs in Trang to have wisdom and boldness to share with their family and friends. for multiplying MBB churches in Trang, that would bring love, hope and restoration to their communities and to the violence in the south. History Fact: Trang is the first place where rubber was planted in Thailand. Rubber is a major export of the country. The largest church in Trang, Light of Trang Church, has seen 10 Muslims come to faith in the last few years! These new MBBs are being encouraged to share their faith with their families, which takes great faith and boldness. With its large congregation, Light of Trang Church has great potential to be a blessing to their Muslim neighbors through showing love and sharing the Good News. Unfortunately, Muslim-focused disciple making and church planting has not yet received precedence amidst other church activities. Imagine the impact they could have! 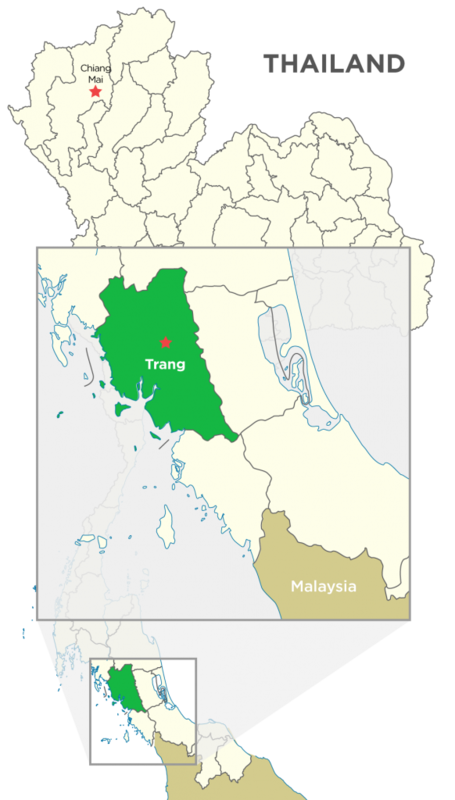 Join us in praying for our brothers and sisters in Trang to embrace the freedom their location gives them to share the gospel, and pray for the Muslim communities who need the new life Jesus offers them. Malaysia is a federal constitutional monarchy with a parliamentary system of government. The country is separated by the South China Sea into two parts, Peninsular Malaysia and Malaysian Borneo. Located in the heart of South East Asia, Malaysia is surrounded by other countries such as Thailand, Indonesia, Singapore, Philippines, Vietnam and Brunei. Malaysia’s capital is Kuala Lumpur. Malaysia’s official religion is Islam. However, the freedom of religion is also guaranteed by the constitution. Of the 28 million Malaysians (Malays, Chinese and other ethnic groups), 60.4 per cent are Muslims. Malays (the largest ethnic group) are generally Muslims. There are also Indian Muslims and a small number of Chinese Muslim converts. Although the previous and present Prime Ministers have made proclamations that Malaysia is an Islamic nation, certain segments of the population have resisted this status, pointing to the nation’s secular constitution. Proselytizing Muslims is prohibited by law and conversion out of Islam is also forbidden. Believers from a Muslim background are few in number. Many worship in house churches and retain their Islamic clothing and some cultural customs to avoid detection and harassment. In many cases, they discovered the Messiah through a direct divine encounter. Though they are few in number, they are courageous in their witness and their faith. Pray for believers to open up their hearts to their Muslim neighbours and to be a blessing to them in practical, concrete ways. Pray for believers to be courageous while extending the hand of fellowship and assistance to new people (it can be risky).